Waruda primary school in Maharashtra’s Badnera town is like no other municipal school one would come across. 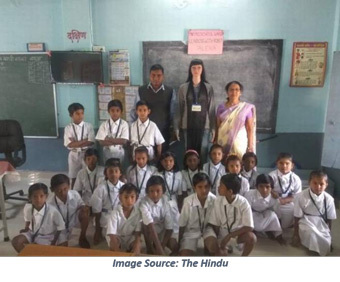 This Marathi medium school has three teachers for its 42 students studying from classes I to IV – Mr. Amol Bhuyar, the teacher, Ms. Sushma Kapse, the headmistress, and ‘Alexa’, Amazon’s virtual assistant. Combining their funds, Ms. Kapse and Mr. Bhuyar purchased the Amazon Echo device, and built a mannequin around it, thereby giving a face to Alexa. Though the children could not communicate in English at first, they began learning with the help of their teachers. The two teachers taught the children to ask questions to Alexa. The children now learn math, poetry, GK and a lot more from the device. Mr. Bhuyar thought about implementing Alexa in the classroom, during a ‘go digital drive’ by the Amaravati municipality. Ms. Kapse and Mr. Bhuyar took 11 months to train the students to talk in English, as they used to communicate only in Marathi. Today, the students ask Alexa around 15 questions every day. Despite poor network in the area, the teachers believe that technology not only imparts an interactive learning, but also adds an element of fun.